Everyone has their own thing. My thing was novels. In middle school and high school, I spent many an afternoon at the library, searching the fantasy/sci-fi shelves for a new adventure. Occasionally I’d find a good one, with a gratifying mix of characters whom I could befriend and aspire to be. I spent hours reading, switching between our pieces of furniture to ease the ache in my back and neck. I resented mealtimes because my mom forced me to put down the book. As a Christian, I wanted to love God more than anything else. When a new story seized my imagination, I wondered if I ought to give up reading because I enjoyed it too much. The intense pleasure I found in good stories must be idolatry, I thought. Why didn’t the Bible captivate me like Lord of the Rings? If I were a better Christian, wouldn’t I rather pray for hours at a time than read novels? Why did I devour fiction in a day while struggling to read the Bible for 15 minutes? Like most other Christians, I knew idolatry was wrong. I also knew I should be thankful for the blessings God has given. What I knew about relating to the good things in my life stopped there. I didn’t know how to respond when I sensed I was enjoying a blessing more than God, or when I felt guilty for having more possessions than others. How could enjoying good things square with self-denial and generosity? Sometimes I looked for satisfaction in God’s gifts instead of God. Other times I pulled away from them entirely, trying to find joy in spiritual things and waiting for “the things of earth” to “grow strangely dim,” as the hymn puts it. 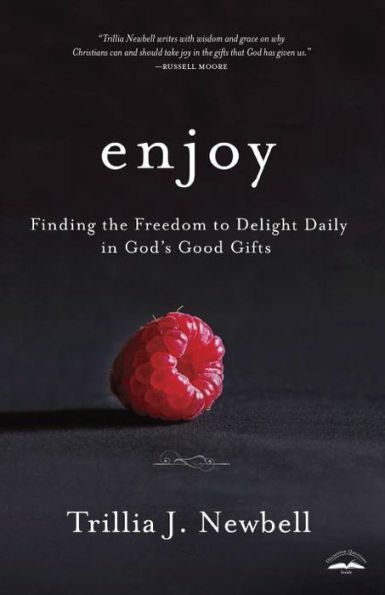 As I read Trillia Newbell’s Enjoy: Finding the Freedom to Delight Daily in God’s Good Gifts, I wished I had read it a decade earlier. It would have eased my conscience when I found intense pleasure in a good book, and it would have sharpened my love for Jesus at the same time. Multnomah (2016). 240 pp. $14.99. Enjoying God’s gifts is a means, not an enemy, of enjoying God. Enjoy celebrates eight of God’s good gifts and then God himself. Newbell describes a good thing in each chapter, highlights some particular temptations that can accompany it, and describes what God intended it to be. Earthy, relatable examples from her own life drive home her points. Enjoying God’s gifts is a means, not an enemy, of enjoying God. This book doesn’t go deep into the underlying theology, but instead shows what enjoying God through his gifts looks like in real time. Each chapter ends with a list of ideas for enjoying its particular blessing. Newbell calls these lists “The Enjoy Project” and says she designed it as “a tool to help us put our faith into action” (17). Suggestions include “find a new way to encourage someone close to you” in order to better enjoy friendship, or “fast” in order to better enjoy the gift of food. Newbell recommends recording the suggestions you follow in a journal or on a blog so you can look back and be thankful. Throughout the book, I appreciated Newbell’s focus on Christ and the gospel. Every list of suggestions for The Enjoy Project ends with “pray and preach the gospel to yourself.” It hit me as I read that the good things in my life are all God’s grace to me. Sometimes we call the good but “unspiritual” blessings of life common grace, since they’re common to believers and unbelievers alike. The grace may be common, but it’s still amazing. I can be enthralled with a good book or feel my heart rise with a symphony because God makes beautiful things. Every good thing in life, down to the smallest detail, is worth praising God for, because it’s all totally undeserved. In other words, it’s all grace. Enjoy is written simply enough for people in all life stages to understand. Newbell quotes theologians like Jonathan Edwards and skillfully connects lofty ideas with the challenges and joys of everyday life. For anyone who wants basics and ideas for growth, pairing practical truth with engaging applications, Newbell’s book is a good gift to be enjoyed. Charissa Crotts is a senior at Boyce College, majoring in biblical counseling. She enjoys readings, writes for Southern Seminary, and blogs occasionally. She attended WORLD Journalism Institute and hopes to pursue journalism and biblical counseling after graduating next May.